DigiVol reaches 1000 volunteers and more! The Atlas of Living Australia, in collaboration with the Australian Museum, developed DigiVol to harness the power of online volunteers to digitise biodiversity data that is locked up in biodiversity collections, field notebooks and survey sheets. DigiVol has attracted volunteers from all walks of life, and they are proud to announce that the 1000th volunteer has just joined the community! 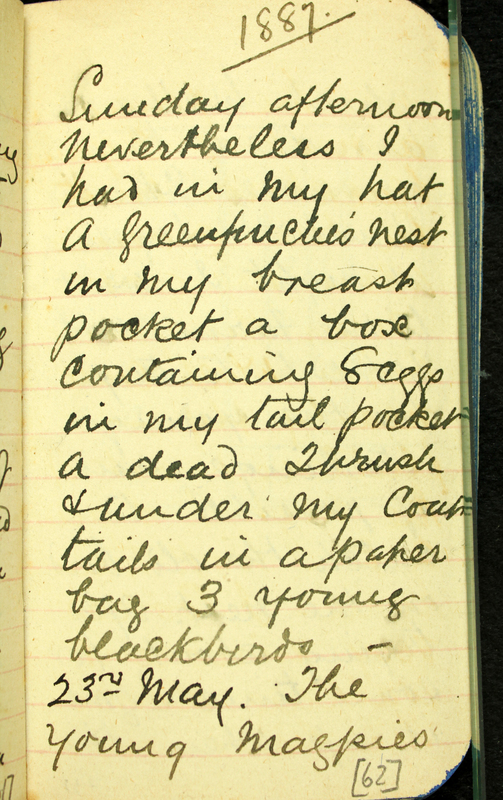 DigiVol enables volunteers from around the world to transcribe handwritten diaries, scientist notebooks and specimen labels, and identify location data – in turn creating a digital record for physical ones. Through DigiVol, volunteers are helping museums and universities to make their research material available to everyone online. The data has many uses but most important is that it can help scientists and planning officials better understand, utilise, manage and conserve Australia’s precious biodiversity. Transcription from one of Megan’s favourite Edgar White diary pages. In the ground when we got near the young birds which could nearly fly.- fluttered out of the nest. I ♂[male] and 2 ♀[female] I took them home. I looked very innocent walking down the lane on a Sunday afternoon nevertheless I had in my hat a Greenfinche’s nest in my breast pocket a box containing 8 eggs in my tail pocket a dead thrush &[and] under my coat tails in a paper bag 3 young blackbirds. on arriving home I had a bath put my trousers into a tub and went to bed. Edgar Ravenswood Waite (5 May 1866 – 19 January 1928) was a British/Australian zoologist, ichthyologist, herpetologist, and ornithologist, a curator of the Australian Museum between 1893-1906. He accompanied various trawling expeditions in the Pacific and sub-Antarctic and wrote of his work in diaries now housed in the Australian Museum Archives Collection. DigiVol and its capability to assist with the enormous task of digitising their collections is not restricted to Australia’s museums and collections either; institutions like the Smithsonian, New York Botanic Gardens, and Kew Gardens have also chosen DigiVol to host their own virtual expeditions to digitise their collections. The University of Melbourne Herbarium is the latest collection institution to join in the DigiVol effort, with their first expedition focusing on legume specimens from the Burnley Horticultural College. If you’d like to get involved and join DigiVol, simply head to www.volunteer.ala.org.au and there’s a Facebook group too. Happy transcribing!